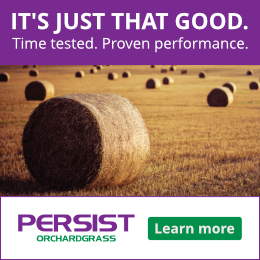 With the discoveries that red clover can increase weight gain and prevent fescue toxicosis, we thought you’d like some info on how to add it to your pasture. Thanks to Genevieve of Kings Agriseeds for helping us out with this! Not only does red clover boost a pasture’s quality, diversity, and even yield, it’s also easy and economical to add in to an existing stand. Red clover is tolerant of a wider range of soils than alfalfa – including some heavier soils with lower pH conditions – and the small seed broadcasts easily. The seedling tolerates shading to some extent, as well, which makes interseeding into sod more successful. Red clover grows taller and more productive than white clover, but has to be managed carefully and is generally treated as a 2-3 year crop. Early flowering red clover types include common medium red clover, suitable for 2-3 hay cuttings per year. Late-flowering red clovers, such as mammoth types, are generally good for one large hay crop per year, plus aftermath growth, and are better in cooler climates. Stoloniforous types spread more readily, and can be more drought tolerant. Red clover can be grown as a pure stand, a companion crop, or sod seeded. Look for varieties that are resistant to northern and southern anthracnose, powdery mildew, and root and crown rots. If you are interseeding, make sure you maintain fertility levels – soil test and topdress accordingly. Clover is best to establish in late summer, when weed competition will be lower. Plant into a well-prepared, firm seedbed, up to ¼ inch deep. Soil pH should be above 6. Nitrogen fixation and nodulation will be suppressed at a lower pH, in which case fertilizer would need to be supplied. A starter fertilizer of 20-60-20 can be used. Keep in mind that although they produce their own N, legumes will need plenty of added P, K, and micronutrients. In a haying situation, clovers generally remove 30 lb of phosphorus and 90 lb of potash per year. Don’t forget to inoculate red clover with a clover type inoculant. It grows in association with this specific strain of Rhizobium bacteria, which provides it with nitrogen in exchange for the plant-supplied sugars. It is best to grow red clover in combination with a grass. Agronomically, mixes are always stronger than monocultures, and allow other species to persist and spread (depending on the species) as the clover thins. Red clover pairs well with a variety of cool season grasses, such as orchardgrass, timothy, or tall fescue. Clovers tend to thrive more in the heat of summer than their cool season grass companions, helping to even out the pasture’s forage supply. Mixing in grass will also greatly reduce the threat of bloat to the animal that comes with pure stands of many legumes. Seeded in the spring, it can be grazed in early summer of the seeding year, but avoid grazing after about mid-September through the first frost to develop the root reserves needed for winter survival and disease resistance. Grazing pre-bloom won’t hurt the clover. It can be good to graze it in early spring, since the red clover is high in magnesium and complements lush spring grasses that can have a deficiency and lead to grass tetany. Rotational grazing is the best practice to preserve stand longevity, since you allow a full cycle of regrowth after each grazing, building up plants’ root energy reserves. Adding clover to a pasture improves agronomic health of the stand in addition to improving the nutritional profile. Especially in a pasture containing toxic fescue, red clovers with biochanin A can be an important for preventing fescue toxicosis and improving weaning weights, and for milk production, and conception rates. At ground level, it is an excellent way to supply your grasses with some N (replacing on average 60 lb/A of N) and red clover is one of the easiest legumes to do this with. You will need to suppress the grass until the clover becomes established. Use higher seeding rates of the clover to compete with the grass. If frost seeding in late winter, you can use a disk or field cultivator to disturb the sod first, reducing grass competition and leaving more soil exposed for the clover seed to come into contact with. In the spring when early grass growth begins, you can graze or clip it back (flash grazing to reduce competition from other species works well). Avoid fertilizing with N, which will stimulate competitive grass growth. Chemical suppression of grass is another option, using a product such as paraquat. Since this is a contact killer, it must be done after grass breaks dormancy in spring green-up, when it’s actively growing. Once you’ve included your clover, be sure to manage pastures to give it some advantage as it gets started. Avoid letting the grass get too tall and mature, or it will shade out legumes. At 6-8 inches height, the mixed stand can be grazed down to about 2-3 inches, which is a little lower than the grasses prefer, and allows light to penetrate down to the seedlings. Once established, your stand should be fertilized with N if red clover makes up less than 30 percent of the grass-clover stand. Red clover can be grazed at pre-bloom to early bloom, about a 30-35 day interval, depending on the time of year. How does red clover stack up? Protein content of red clover can be almost as high as alfalfa. The plant tissue tends to contain less lignin, making it more digestible. Quality also does not decline as quickly with maturity. Red clover’s thick taproot can grow 24-36 inches deep, and by itself it can produce about 3-5 tons of forage per acre. It is not as drought-tolerant or easy to dry as alfalfa, however. In a haying situation, reduced hair varieties are quicker drying and need less tedding, which helps minimize leaf loss. Red clover provides greater forage yield than white clovers, which tend to be more low-growing and spreading, but has less grazing tolerance and longevity. Red clovers remain productive later into the summer, however. Although all clovers are susceptible to a range of fungal diseases, they are low-cost and easy to reseed. When Can I Start Grazing Mixtures? Genevieve provides forage and cover crop research and marketing support for King's AgriSeeds Inc. in Lancaster County, PA. She has also worked on organic vegetable farms and as an intern in agricultural field trials at the Rodale Institute.